Review Summary: A wonderful collection of posthumous material, Elliott Smith's New Moon serves both as an enjoyble listen, and a testament to the fact that, even at his worst, Elliott was still a surreal talent. For those of you who have never walked your streets at midnight, staring at the moon and kicking empty beer bottles while wallowing in a hazy stupor of bitter self-pity, then perhaps you might not truly appreciate the brilliance that Elliott Smith can share with you. But for those of you who have found the satisfaction of crunching of broken pavement bits beneath your feet while staring into the vacant glow of a lonely streetlight, the arrival of Elliott Smith’s 2007 posthumous rarities collection, New Moon, is undoubtedly, if nothing else, a thoroughly exciting prospect. Assembled from the bits and pieces of studio time he had logged and flavored with a handful of acutely intimate living-room 4-track manifestos, New Moon is the vehicle his Kill Rock Stars label is using to flush out the last remnants of tape still laying around the vaults- mostly gems and mementos from the years of 1994 and 1996- (his oft-described peak years, sandwiched right between his commonly-accepted apex Either/Or, and it’s predecessor, Elliott Smith). 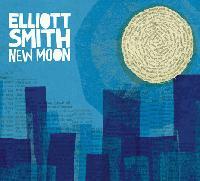 Combining an eclectic array of clever full-band compositions and lonely reflective acoustic wanderings- all sprinkled with Elliott’s part junkie, part street-poet lyric persona, New Moon offers us freakishly well-put together sketch of where Elliott was, both musically and emotionally at this moment of his life. And all of this, surprisingly, is evident of on New Moon. From the brilliantly intricate opening folk waltz of “Angel in the Snow” it is clear that even Smith’s allegedly inferior works possess an invaluable musical worth. Wistful, wandering- these brooding songs seep out from the speakers and almost immediately drape you in a somber and pensive whirl. The deathly croon in “High Times”, the earnest humility of “First Timer”, the frantic begging of “Big Decision”- all moments of pure clarity that make this compilation such a fantastic piece of passion and honesty. While not quite a thorough portrait of sheer desperation and fear as his albums (nor the subsequent From A Basement On A Hill, Elliott’s highly successful like-minded posthumous release drawing from later material)- in it’s place is this curiously different side of Elliott- a more comforting, almost optimistic style of thinking. True enough, there are more then a handful of the familiar “dear-diary” street-wise junkie monologues (take example from “New Monkey”:I’m here with my cup / afraid to look up / this is how I spend my time / lazin’ around, head hangin’ down / stuck inside my imagination / busy making something from nothing.). But here he also seems to reveal his wonderfully sweet (if not short-lived) playful side- see the tender, prepubescent love premise of “Thirteen” and the down-but-looking-up hopefulness of “Whatever (Folk Song in C)”- both cast in a wonderfully spacious euphoria of swirling acoustic guitar strums, simplistic in nature but masterfully flourished by hidden subtleties. Guys, I apologize for the blatant use of clichéd sentiments concerning the whole Elliott/dead/genius equation, but *** if this isn’t a poignant manifestation of just how much talent the music community at large lost when Elliott’s chest was pierced by that knife. Of course, this album isn’t really a perfect listen. I’ve been ranting and espousing the New Moon cause like an unemployed union worker, mostly because it’s just so rare to see an unpolished odds-and-sods collection that works so well. There are a few throw-away tracks somewhere around here, disc one mostly outshines it’s less impressionable counterpart, and it’s the individual songs that really leave the lasting impression on the listener- not the odd, slightly disjointed feeling on incompletion one suffers when finishing a listen of the record as a whole. But essentially, when taken as what it is- a raw, untouched collection of semi-related sketches, it’s still clear that even at his most basic and unpolished, Elliott was worthy of the many colorful laurels thrust upon his name. With New Moon, the usually Elliott rules still seem to apply. All of the songs are like shy little creatures who need to be coaxed and revisited many times over before they really reveal just how intricate and beautiful they are. The weighty songs swagger in just the right way; the loftier woes drift down like a soft snow, just as they ought to. Yet as with all of Elliott Smith’s intensely heartfelt musings, one last odd quality seems to characterize his music. As obviously good as Elliott Smith is, he seems to falter and lose power in group settings. The full, beautiful, haunting effect his work can only truly be appreciated in listening in solitude- in the still darkness of an introspective hour. May I suggest a midnight stroll"
I've heard a few songs that are on this and they are amazing. One thing that I love about Elliott's work is that it's so consistent. Every song has something new to enjoy. I can't wait until I can go pick this up. New Monkey is pretty much awesome. I only have Either/Or and it's quickly becoming one of my favorite albums. I'm going to have to get this along with the rest of the discography. I'll try and get hold of this. wonderful review...but i don't know if you can get away with using espousing twice in such a small piece. but honestly its a job well done. This is just as good as any old elliott smith, and the old stuff is my favourite. excellent cd. Solid material, but I prefer XO to his older work. Awesome review, I might have to get this. Featured! Good job on the review and such. Surely this would mean you'd get approved. this collection was just what Elliott Smith fans needed. I love it. I remember I was buying some Elliott Smith albums and when I paid for them, the cashier said, "he's got a new album coming out" and I said, "uhh... he's dead." I have to buy this! Good review btw. Probably the album Im most excited about this yea- though that probably just says something about the lack of decent music out there/ my penchant for old artists. Personally I think XO was far and away his best album, even though Either/Or contains his best song/s. This collection sounds pretty much as good or better than any of the other Smith albums imo. If anyone wants a listen try his myspace- i think theyve taken the whole album down though. The second half of disc one is so good. Very glad this was released. Informative review, even if it is very fanboyish. tbh it's the only way i know how to write these things. great review, but ive never heard of elliot smith...which is the best album to start with...or song? Check out his self-titled or Either/Or. And idk Needle in the Hay is a classic.